We are Nick and Kathy Bowles, an ordinary couple with a small boat on the West Coast of Scotland who decided to have a gap year before they got too old. The website address is ZNOY8 because that is the callsign of the boat. Our plan was to head South from our home port of Balvicar near Oban in Scotland, then cross Biscay from Southern Ireland and cruise down the rias of Spain before crossing to Madeira and the Canaries with a view to an Atlantic circuit if we were feeling brave. In the event we decided to cruise the Canaries for the Winter then return via the Azores, sailing a total distance of just under 6000 miles in 54 weeks. 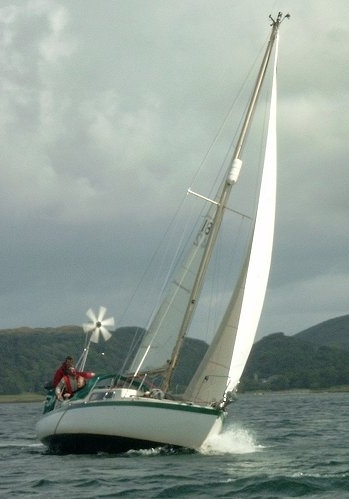 We bought Fairwinds in 2003, three days before we moved into our new home on Seil Island. Our first 'long' cruise took us across the Minch and up to Stornoway for the Hebridean Festival of Sail - you can see some pictures here. In 2005 we sailed to Orkney then back down the Outer Hebrides to Barra and the islands South of Barra. We kept a weblog of this trip here, but unfortunately we never finished it . . . our log of this trip has been a lot more thorough and is now complete. Fairwinds is a 1973 Albin Vega Mk II, sail no. 1842. We have upgraded her extensively for this trip. You can see further details of the boat and equipment by using the main menu at the top. The crew? Well,there's just the two of us. I have a Yachtmaster with commercial endorsement and have recently been working as an RYA Cruisng Instructor running Day Skipper and Comp Crew courses. Kathy has her Day Skipper practical and over five thousand miles to her credit. We are starting with very little in the cruising kitty but hope to have a regular income while cruising from renting out our house and from web design and income from our various websites. Again, more details elsewhere.